A scion of two great families, Arthur James Balfour was born to wealth and privilege and possessed intellect and charm in legendary abundance. On succeeding his uncle as Prime Minister in 1902, it seemed that he had come into his inheritance: a true grandee, his path to the summit of power seemed to be almost without obstruction. He held office longer than any other Cabinet minister and dealt with successes and defeats with similar equanimity during his 50-year career. 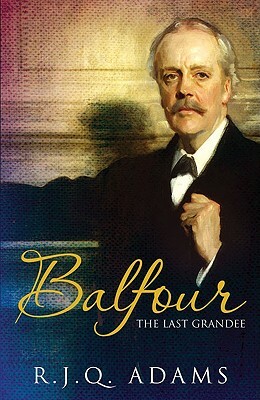 Balfour was a Conservative but never a true-blue Tory like the powerful squirearchy who viewed him with awe but often found him difficult to understand. He was in fact many different things: a Scottish laird and an English sophisticate; a ferocious partisan and a celebrated philosopher; a champion of Christianity yet a defender of spiritualism; an Imperialist and a Zionist; an Etonian and a reformer of state education. His premiership was eventually destroyed by party strife, yet he was the maker of the 1917 Balfour Declaration as well as the 1926 Balfour Definition of the Commonwealth, and at age 73 he dominated the pivotal 19212 Washington Naval Conference. Balfour's was a remarkable life, unimaginable today no matter one's talents or wealth. R. J. Q. Adams is a professor of history at Texas A&M University and the author of several books, including "Bonar Law" and "Europe"," 1890-1945."